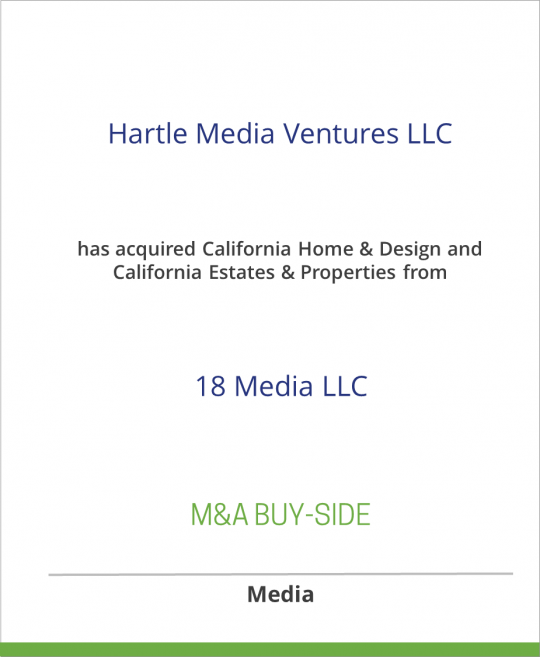 Hartle Media Ventures LLC has acquired California Home & Design and California Estates & Properties from 18 Media LLC. 18 Media, LLC publishes California Home & Design – a 10-year-old magazine – and California Estates & Properties. Based in Menlo Park, California Home & Design’s editorial focus is home design and interiors in Northern California. With a circulation of 45,000, it is the preeminent, high-end home and garden magazine of California, with its roots in the Bay Area. Hartle Media Ventures, LLC, is publisher of 7×7 magazine, a smart and stylish bi-monthly that celebrates San Francisco people, their stories, and their lifestyles. Now in its fourth year, 7×7 has a circulation of 48,000. Owner and CEO Tom Hartle founded Hartle Media five years ago as a West Coast rep firm (advertising representative firm) which continues to service national magazines Spin and Popular Mechanics in its home territory, San Francisco and Northern California. Hartle Media also custom-publishes State Parks Guides for the State of California. Previously, Mr. Hartle was the founder of Hour Detroit, a younger-audience-targeted city magazine similar to 7×7, which he sold successfully in 2000.